Posted by Samuel Snoek-Brown in Kitchen & Bath, Smiley. 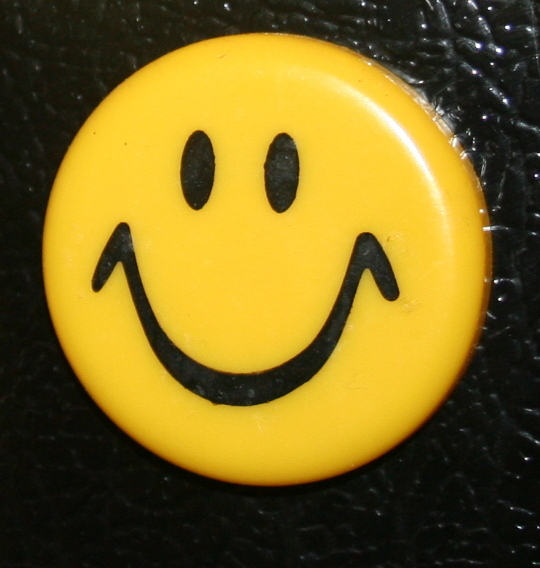 One of my happiest refrigerator magnets. I’ve had this happy magnet for ages. 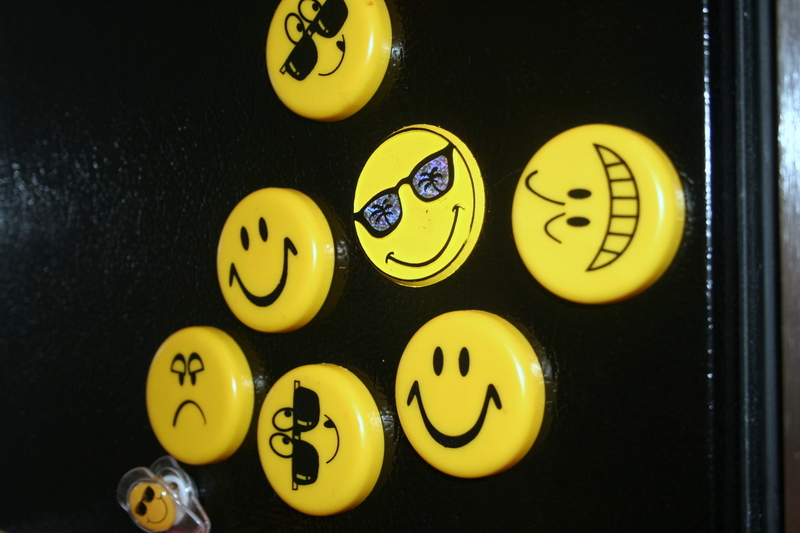 It’s part of a whole gang of smiley (and not-so-smiley) faces that lives on my refrigerator. The whole gang — including a few cool smileys, a leering mischievous smiley, and a grumpy old frown. The gang isn’t exclusive — these smileys do pal around with other smileys, including a different style of “cool” smiley, some of the smiley clips I’ve featured on the blog before, and — not in this photo, but in the vicinity — a smiley face for the state of Wisconsin, where we lived for a few years. 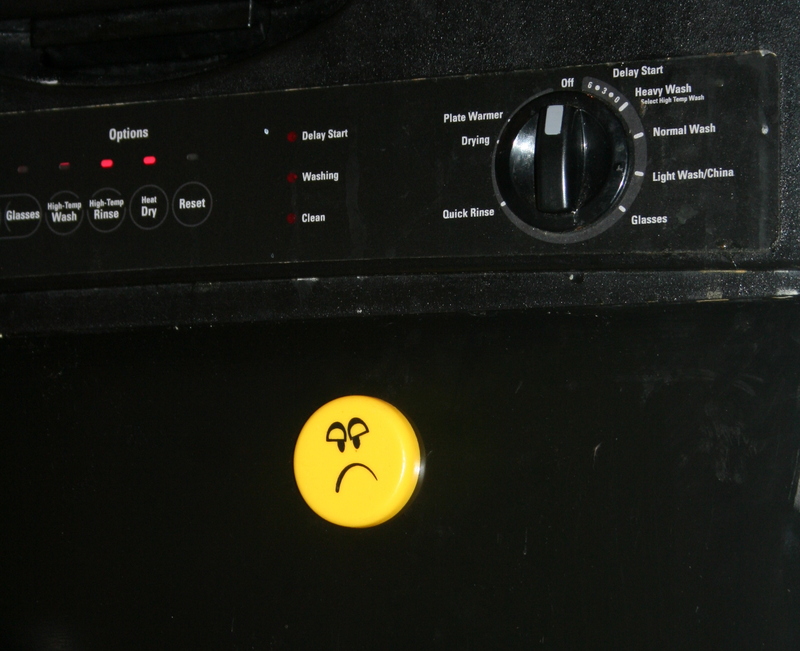 But lately, this particular gang of smileys has been commuting to work: they’re serving double-duty on my dishwasher. I use the traditional smiley when the dishes are clean, the frown when the dishes are dirty, and, once, the mischievous leer when I ran a cleanse cycle on the empty dishwasher. Right now, the dishes are still dirty. Posted by Samuel Snoek-Brown in Public art, signs, & graffiti, Reader submission, Smiley. At least, I’m assuming this is some kind of stencil. 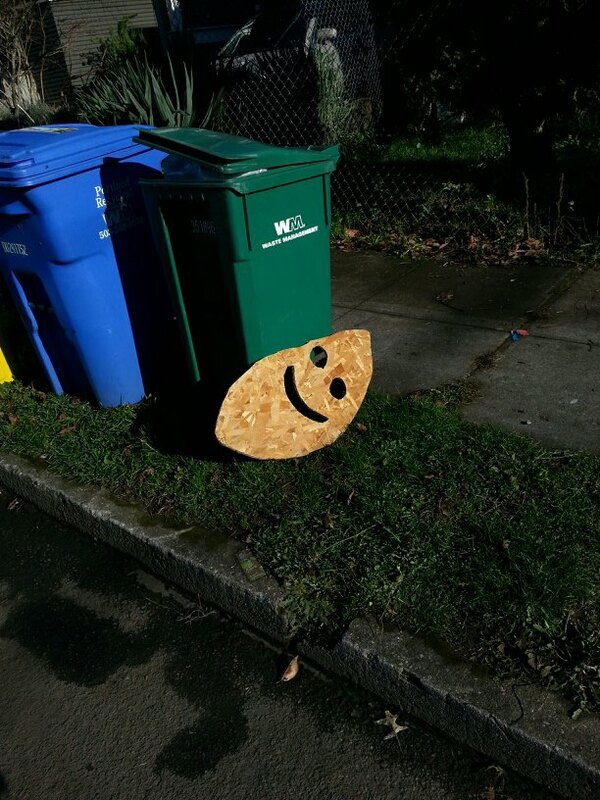 Submitted by Monica D.
This is in Portland, “Where even the trash is happy,” according to my friend Monica. I told her I had to steal it for my blog, and she was happy to let me have it! If I’d been quicker — by which I mean, if I hadn’t been slumping around in sweatpants feeling lazy from post-holiday food indulgences — I would have jumped in the car and tried to grab this off the street. But alas, it didn’t happen. More from the Aunt Cheryl Christmas haul: this time, a set of eight hot pads in four different designs! Posted by Samuel Snoek-Brown in Art, Holidays, Smiley. Posted by Samuel Snoek-Brown in Smiley. But that number, 26,000, isn’t the impressive bit. My total views ever, of all time, from the beginning of this blog two and a half years ago, is more than 35,600. That means that almost 3/4 of my total views ever have come in just this past year. That’s partly down to a steady increase in views over the last year. January had a comfortable 877 views; February jumped just over 1,000, and March leapt to almost 1,500. I was agog. Then May hit 1,900, and after a slight summer dip, I was approaching 2,000 in September, October, and November. And then December 4 happened. I don’t know what caused the spike that day — some computer program running autosearches in England? — but for some reason, my views on Dec. 4 alone topped out at 943. That’s more than the entire month of January. Heck, that’s justa few hits shy of the total hits for my whole first year! The numbers plummeted after that (someone must have stopped running their autosearch), but the momentum was there, and since then I’ve been receiving hundreds of views a day, thousands a week! Every week this month has seen more views than any whole month this year — the third week had almost twice as many hits as any given month! So, as of this writing, my monthly total views for December sits at just over 9,700. That’s well over a third of my entire yearly total — in just this last month. Also, WordPress has started tracking individual viewers as well as their hits, and I’m astonished to find that I’ve had more than 5,750 distinct visitors to this blog in December. You are most, most welcome. Thanks for an astounding last month of a fantastic year, and we’ll see you all back here in 2013. Posted by Samuel Snoek-Brown in Kitchen & Bath, Smiley, The Great Enabler. Cookie jar. A gift from The Great Enabler. I’ve been wanting a smiley face cookie jar for just ages. I haven’t made much fuss about it because there are so many smiley face things out there I love and this is just another one on the list. But man, have I wanted one of these things for a long time. I don’t know if my excellent mother-in-law, The Great Enabler, knew that about me or just assumed that if it was something smiley I would love it (both are true! ), but this was her Christmas gift to me this year! And you better believe it’s already full of home-baked cookies: gingerbread, sugar cookies, peanut butter “kiss” cookies, brownie bites…. Apron. A gift from my Aunt Cheryl and Uncle Sandy. This apron was part of a whole slew of smiley kitchen paraphernalia my Aunt Cheryl and Uncle Sandy sent me. I’m going to try to keep it clean — no making pasta sauces in this apron! — but I am, in fact, already wearing it in the kitchen, starting on Christmas morning when it was fresh out of the box! Making “Dutch babies” — baked pancakes — on Christmas morning. Posted by Samuel Snoek-Brown in Holidays, Smiley. Merry Christmas again, happy readers! This morning, after presents and chocolate, my wife and I sat down to breakfast (homemade “Dutch babies“) and when I took up my mug to sip my coffee, Aunt Smiley broke into sudden laughter and told me not to move. Then she grabbed the camera and snapped this photo. Posted by Samuel Snoek-Brown in Decor, Holidays, Smiley, The Great Enabler. Two years ago, for this blog’s first Christmas post, I shared my plush smiley santa ornament. Last year, I received a new smiley Santa ornament, this one painted glass with my name on it. It was a gift from (you guessed it) my dear mother-in-law, the Great Enabler. Smiley Santa ornament. From my personal collection. And whatever your religion or your holiday practices, I hope you have a very, very happy season. Just in time for the end of the world, most of our holiday cards have arrived at their destinations, bringing seasonal cheer and warm wishes for our last hours on Earth…. Wait. I’m confusing Christmas with the Mayan apocalypse. Holiday cards are a team effort in the Smiley household, with my wife taking the role of addresser (she has better penmanship) while I check the addresses (I have the iPod). And then we sign each card — and, for friends and family, I sometimes doodle this little Santa smiley on the card, as well! Santa smiley. My doodle in Sharpie.